Racing is a strange old game that gets more spectators more emotionally involved than many other things in life - and quite rightly too, because it's an emotive subject involving cold-blooded engineers and hot-blooded romantics all fascinated by bikes going around in circles. As a result we have a very broad church of minds and opinions travelling around the world following MotoGP, most of the time in harmony. 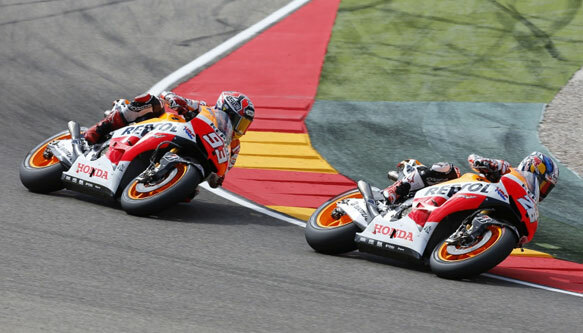 Occasionally, though, there are clashes, as we saw at Aragon when Marc Marquez touched - or should I say brushed against - his team-mate Dani Pedrosa. We know the facts: Marquez out-braked himself going into the Bus Stop corner, opting to go to the right, rather than into the back, of Pedrosa. By the slightest of margins and the freakiest of circumstances, part of Marc's boot/knee slider skimmed over the top of Dani's swingarm right where a cable makes its way from the rear wheel speed sensor back up to the ECU. 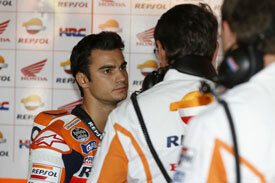 The cable was broken immediately, instantly robbing Pedrosa's bike of its traction control. As soon as he exited the corner and got back on the power, 265 horses spun up the rear wheel and he was thrown. For Pedrosa, who was on form and chasing down leader Lorenzo, it came on the day of his 28th birthday, at his home in Spain and with his family in the garage, watching on as he attempted to close in on Marquez's championship lead. In an instant that was it - his challenge for the title was gone, just as it went at Misano last year when he started from the back of the grid and was then caught up in someone else's accident on the opening lap. Fingers immediately pointed at Marquez (again) and his magnetism to such incidents. He always seems to be there, but like it says on the back of the tickets, motor racing is a dangerous sport. 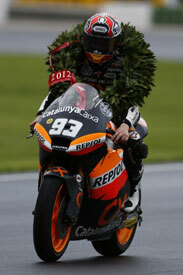 If that tiny little cable hadn't have been cut, then Dani wouldn't have gone down and this column could have been about a Pedrosa win - or the wonderful Scott Redding/Pol Espargaro 'rubbin' is racin'' in Moto2. What did not surprise me about this latest storm in a Spanish sherry glass is where the incident happened, for the Bus Stop features a blind apex to the left. Riders have to brake by familiarity rather than sight, so by definition making a mistake and braking early to be safe – or a tad late because you've over cooked it – is certainly on the cards. I wandered around the track on Thursday and not only is it hard to see the turn-in point to the left-hander because it's over a slight crest, but it's also hard to pick out what you are actually looking at because you get a mirage off the track surface. The ground looks a bit wobbly as you approach it aiming for a patch of asphalt less than the size of an iPad. All with other people around you trying to do the same thing, of course. But all of that means nothing because they're the best in the world and they've been around there enough times to know where to go. Riders exist, however, in a zone to which mortals are not accustomed. 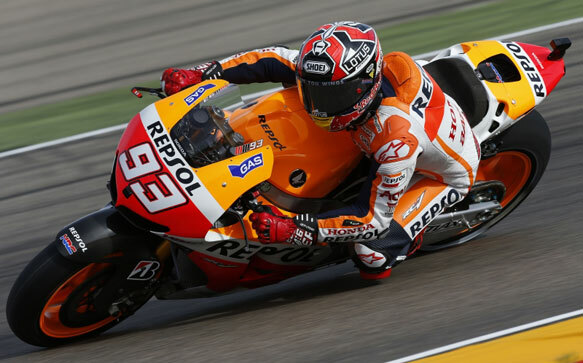 Seemingly logical talk from those never to have experienced a 265bhp, 160kg MotoGP bike ought to respect that fact; when the mist has come down in front of a 20-year-old Marquez who quite patently believes he is immortal, then who are we to judge? It's worth noting here that, of the four-man Race Direction committee and the regular Stewards, only one has ridden a current-spec MotoGP bike (Loris Capirossi) - an angle the FIA has changed in recent years by enlisting ex-riders to be stewards, thus giving extra insight. Race Direction is, however, going to investigate things at the next race at Sepang, with a hearing involving Pedrosa and Marquez and "further technical information provided to Race Direction" after the end of the race to also be assessed. Quite why they need two weeks to wait is puzzling, but that now seems to be the norm. It all leaves them in a bit of a conundrum, particularly with the new-for-2013 system of penalty points being accrued as the season progresses. Rule 3.2.1 says: "Points may be imposed by Race Direction on a rider in any number from 1 to 10, points are cumulative over one season. Automatic sanctions apply to a rider accumulating points as follows: 4 Points - Start the next race from last grid position. 7 Points - Start the next race from pitlane. 10 Points - Disqualification from participation at the next event (or from the race results if this occurs at the last event of the season). Points re-set to 0 after a rider reaches 10 points and serves a disqualification. Points do not carry over to the following season." After Aragon, some were getting emotional about Marquez and resorted to the 'he's got form' argument that he's never far away from accidents. While that charge is indeed fair, the results of those accidents have been dealt with in the past – such as his being relegated to the back of the grid at Valencia last year in Moto2 following his practice accident with Simone Corsi. He still went on to win that race! At Silverstone this year Marquez copped two points after he crashed under yellow flags for Cal Crutchlow's accident in the Sunday morning warm-up. That was a mistake by Race Direction to not have given him more than just a token two, but then again the rules were set out in 1998 when Loris Capirossi blatantly knocked off Tetsuya Harada at the last corner in Buenos Aires to 'steal' the 250cc championship. The same could be said of Valentino Rossi barging into Sete Gibernau at Jerez in 2005 – a move cynics said was undeniably good for business. The problem – as with Formula 1 and the Michael Schumacher 'dirty-driving' era of the 1990s that malformed so many young drivers' thought processes – was that situations had to get out of hand before they were reeled back in again by penalties dished out from the Stewards' office. What happened at Aragon with Pedrosa and Marquez was a case of having an older hand, who was maybe a bit more cautious, being chased by a younger gun slinger who felt immortal – not dissimilar to when Pedrosa was the rookie who knocked his then team-mate Nicky Hayden off at Estoril in 2006. Oh how the karma has turned. It's easy to accuse Marquez of riding dangerously, for it's the very essence of his on-the-limit, 'get out of my Goddam way, this is my racetrack' style. It's also why he's leading the world championship, having won nearly half of the races this year. It's precisely why HRC hired him in the first place. It's precisely why they hired Casey Stoner and Marco Simoncelli. Additionally, Marquez was not the actual cause of Pedrosa's high-side: that was down to the thin wire of a wheel-speed sensor being nipped as Marquez brushed past. Other teams have two sensors in case one fails, but people forget that this is HRC – it doesn't have parts that fail, deeming a 'back-up' unnecessary by definition. The team views it as unnecessary to have two of everything; to have an overweight bike cluttered because of hardware insecurities. Work harder, cure problems, back-up not needed. We all have a doctorate in hindsight, so now the wire will be moved by HRC for the next race at Sepang, just in case by some freak occurance it gets nipped again by a passing rider. 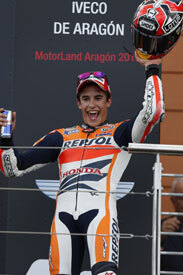 Alas it may well be too little too late – in 12 seasons of MotoGP racing, this is the first time it has ever happened. So, while we look forward to the outcome of the 'extra information' that Race Direction is mulling over, there's a part of me that perversely wishes for Marquez to get some bizarre punishment and be sent to the rear of the grid at Sepang. What he'll then do is win it anyway – and that will cause more headlines than Aragon and prove what a phenomenon the guy is. What do F1 points mean anyway?